A big, beautiful bass that will demand lots of money, energy and commitment from its owner. Fantastic build quality and aesthetics. That’s one hefty body... and pricetag. In the post-MTV Unplugged rock and pop environment, a working bassist can’t claim to have a full arsenal of gear if there isn’t a decent acoustic bass to hand. We see a few of these big-bodied axes here, ranging in price from cheap to steep, and it’s always a pleasure to plug one in and see if it can compete with its ubiquitous electric siblings. Here’s a splendid example from Czech luthier Furch, accompanied by a thoroughly weakening £1400 retail price. Does the flash justify the cash? Our first impressions on whipping the B-62 (yes, it does sound like a WW2 bomber) out of the gigbag in which it arrives is that it’s a) big and b) beautiful. Sure, the body depth isn’t unusual for this style of instrument, ranging from 105mm to 115mm at the hips, but when you add the neck - only the standard 34” scale, but situated forward in the body - the instrument takes up some serious cubic metres. We love the minimalist aesthetic. From the headstock, which resembles that of an electric instrument, to the acres of uninterrupted spruce on the top and the simple bridge and thumbrest designs, there’s not much here to occupy the eye - just how we like it. Strap buttons are provided, the front one beneath the set neck, the rear one also functioning as an input socket. There are no controls to mess things up, although that has obvious implications for the plugged-in sound, and that soundhole placement is a stroke of genius, as we’ll see when we apply fingers to string. Rest your thumb at a location of your choice - you can go roughly halfway back to the bridge before your picking hand falls off the thumbrest - or apply a pick, and you’ll discover the usual acoustic bass sound. 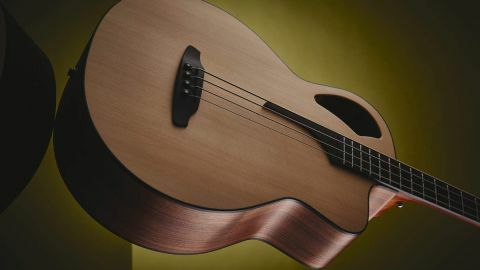 At this point we usually apply adjectives such as ‘woody’, ‘hollow’, ‘crisp’, ‘brittle’ and so on to evoke the sounds coming out of that asymmetrical soundhole, but frankly you know what it sounds like without the need for us to do so. Where the Furch does deliver unexpectedly is at the bottom end, where thunderous bass tones lurk thanks to that big old body. The combination of high-quality tonewoods in the neck - ebony matched with mahogany - and spruce and walnut in the body not only reveals the source of that massive tone, it also goes some way to explaining where your £1400 went. There’s some snap at the top end, of course, but lows and mids are where the Furch is happiest, so plug into your favourite preamp and roll on the treble if you’re after a properly glassy sound. Thanks to the zippy body design, the 21st fret is easily accessed, sounding clear and strong rather than the usual weak gasp you get when you have to overstretch to reach that high. Slapping is doable, although you obviously need to find a comfortable position given the body depth, and chordal playing is a clear strength thanks to the slinky neck and sympathetic string spacing of 40mm at the nut. Your picking hand will feel a little more secure than it does with most acoustic basses, partly because there’s no soundhole beneath your fingers and therefore no slightly unnerving feel of a bottomless abyss beneath the strings. Some basses demand a lot from their player. Rather than submit to your style, they require you to adjust your playing to fit their dimensions. This is one of those. Although the B-62 is a superb instrument with state-of-the-art design and build, you have to work to maximise its potential. Once you’ve done that, though, you have an instrument that earns its high RRP. Remember, of course, that more affordable acoustic basses are available that do a similar job, so try before you buy.